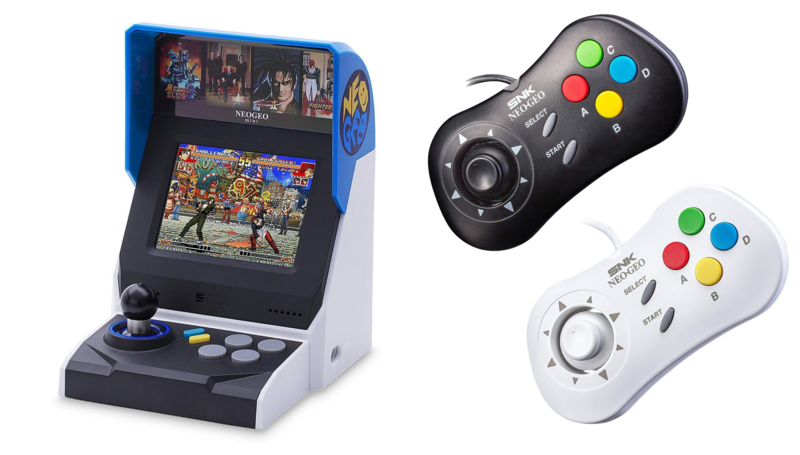 Announced earlier this year, SNK's miniaturised classic arcade cabinet - the Neo Geo Mini - is available for pre-order from Amazon, in a fancy new International Edition, releasing October 15 2018. The Neo Geo Mini: International Version comes loaded with 40 classic Neo Geo games in the system by default, including classics from the Metal Slug, King of Fighters and Samurai Shodown franchises. The Mini is modelled after classic Neo Geo arcade cabinets, which were hugely popular in Japan and the US, albeit with different colour schemes in different territories. The International version available for order here reportedly includes 14 games not previously included in the Japanese Neo Geo Mini release. The system is HDMI enabled and features a 3.5-inch display that runs at the ideal resolution for classic Neo Geo games. All of this will cost you $109 while the stocks last. In addition to the sytem itself, you can also order yourself Black and White controllers modelled after the classic Neo Geo home console pads. Those will set you back $25.90 each and release the same day as the system itself. Outside of the US market, the system and controllers are available to pre-order from Amazon UK, where the Neo Geo Mini will cost you £129.99 and the Black and White controllers will set you back £24.99 each. The whole lot releases slightly later in the UK - launching October 29, 2018. Tragically, the one big omission here is the original version of Windjammers, though that game is mercifully available on PS4 currently - and soon Nintendo Switch. Stock is likely to be limited at launch, so if you're determined to get yourself one of these little guys, now's your best chance.